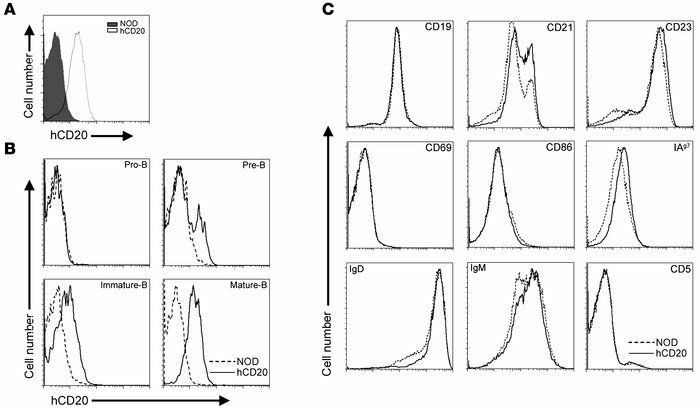 Phenotypic expression of transgenic hCD20 on B cells. (A) Splenocytes from hCD20 mice were gated on B220+ B cells and stained with anti-hCD20 mAbs (2H7). All mature B cells expressed the transgenic hCD20. (B) Expression of hCD20 in BM cells of transgene-positive and control NOD mice. (C) Phenotypic characterization of hCD20 transgene-positive and control NOD mouse spleen cells. The splenocytes were gated on B220+ cells prior to analyzing for the different B cell markers.